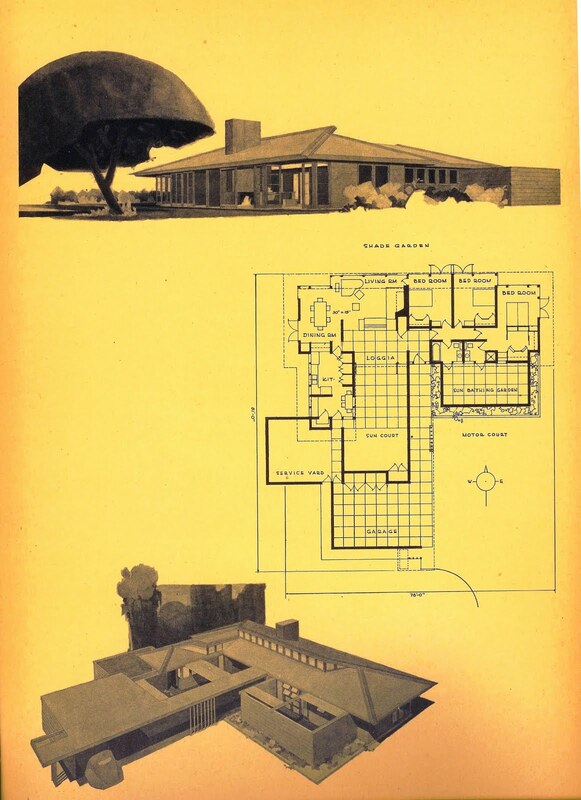 1945 Henry N. Wright and George Nelson book: Tomorrow's House (full text); Chapter 15 is "Solar Heating"
1948 Geoffrey Baker & Bruno Funaro book: Windows in Modern Architecture; section "Solar Heat"
1950 James Marston Fitch paper: "Buildings Designed for Climate Control"
1955 Life article: "Fresh Face to the Sun"
1955 Mechanix Illustrated article: "Hot News about the Sun"
1955 Popular Science article: "New Sun Furnaces May Cool Houses, Too"
1959 Richard C. Jordan paper: "The Future of Solar Heating"
Popular Mechanics article (1945): "Your Solar Home is all Wrapped Up"
1944 Popular Mechanics article: "Solar House Reduces Fuel Bills by One-Third"
1998 Chicago Tribune article: "Cold And Dreary Chicago Was An Early Sun City"
1944-45 pamphlet: "Solar Houses: An Architectural Lift in Living"
1946 patent: "Method and Apparatus for use in Designing Solar Houses"
1945 book Tomorrow's House (full text) by Wright and George Nelson; Chapter 15 is "Solar Heating"
2005 Old House Journal article: "Let the Sun Shine"
2008 Tom Solon article: "Rehabilitation of Henry Wright’s Ramirez Solar House"
1953 Austin Whillier dissertation: "Solar energy collection and its utilization for house heating"
1957 article on MIT house 4: "The House that Stores the Sun"
1962 Popular Mechanics article: "Sun Heats Test Home"
1963 Hottel paper: "Collection of Solar Energy"
1976 Dietz & Czapek paper: "M.I.T. 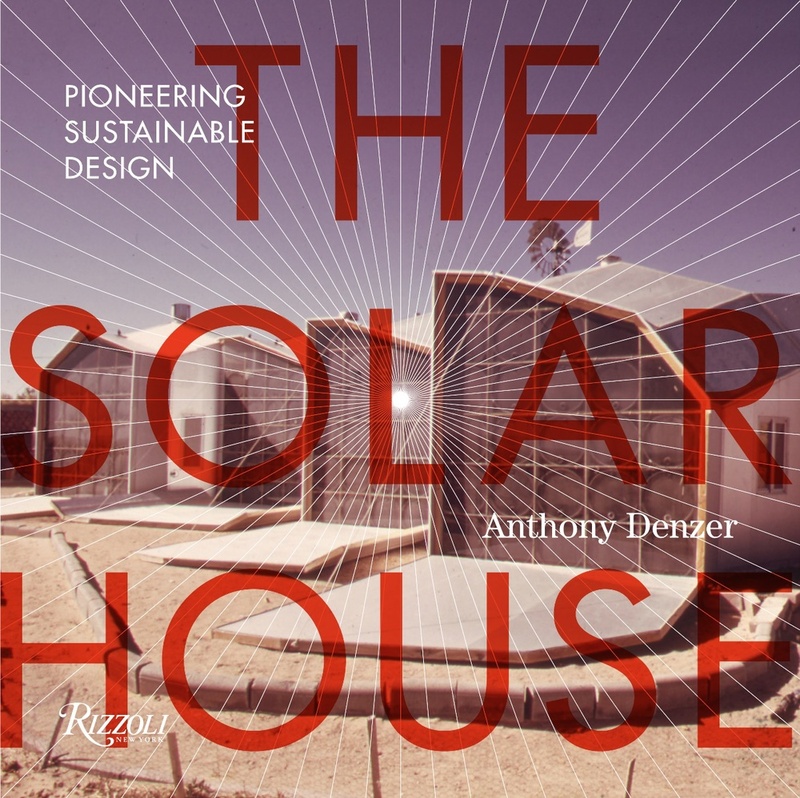 Solar House 2"
1980 Barbara S. Parker thesis: "Institutionalizing Solar Thermal Technologies in the Homebuilding Industry"
1951 Telkes article: "Future Uses of Solar Energy"
1952 Telkes article: "Warmth for Comfort"
1980 Popular Science article: "Solar salts"
2010 MIT Article: "The House of the Day After Tomorrow"
1958 Popular Science article: "Will Your Next House Get Its Heat from the Sun?" 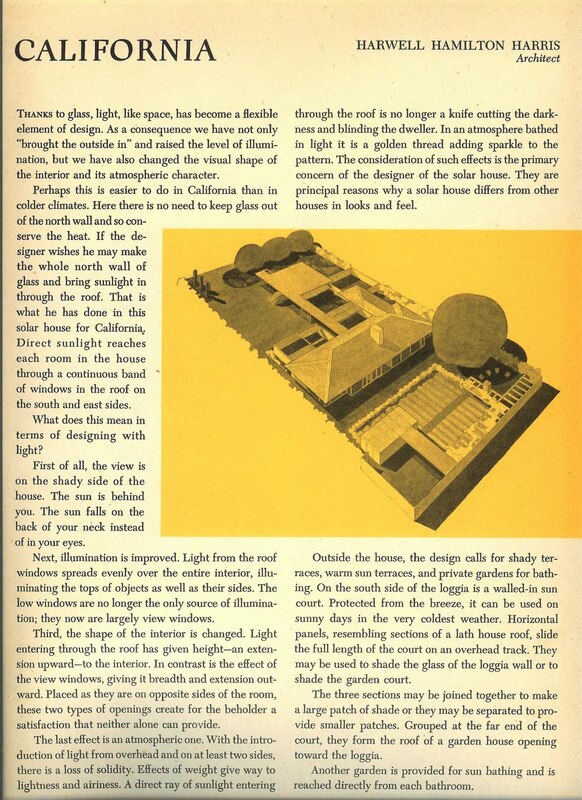 1963 Löf paper: "The Heating and Cooling of Buildings with Solar Energy"
1969 Löf and Tybout paper: "Solar Housing Heating"
1974 Löf paper: "Solar House - Colorado State University"
1974 Löf paper: "The Colorado State University Solar Heated and Cooled House"
1974 Löf and Tybout paper: "The Design and Cost of Optimized Systems..."
1976 Löf paper: "Heating of Buildings with Solar Energy"
1956 Life article: "Warm Winter Behind Glass"
1957 Popular Mechanics article: "Albuquerque Solar Building"
1974 Stanley Gilman paper: "Solar Assisted Heat Pumps"
1978 Popular Science article: "Higher efficiency with solar-assisted heat pumps"
1976 Bliss article: "Why not just build the house right in the first place?" 1959 Yellott article: "Heat Your House with Solar Energy"
1976 Yellott paper: "Early Tests of the Skytherm System"
1976 Trombe paper: "Some Performance Characteristics of the CRNS Solar House Collectors"
1977 article: "Passive Solar Design Using a Two-Story Trombe Wall"
1976 van Dresser paper: "Sundwellings Presentation"
1977 Mother Earth News article: "The Sundwellings Project"
1974 Mother Earth News article: "Steve Baer's Beadwall Insulated Window Panels"
1976 Baer paper: "Corrales Residence"
1976 Baer paper: "Moveable Insulation"
1965 Popular Mechanics article: "House with Sunshine in the Basement"
1973 Popular Mechanics article: "The house that has its furnace in the sky"
1974 Hay paper: "How to Stop Cooling Loads before they Start"
1976 Hay paper: "Atascadero Residence"
1976 John Yellott paper: "Early Tests of the 'Skytherm' System"
1976 Kenneth Haggard paper: "First Cost Economic Evaluation of the Atascadero Skytherm House"
1976 Philip Niles paper: "Modeling the Atascadero House"
1976 Saunders paper: "Weston Residence"
1976 Saunders paper: "Economics - One View"
1975 article: "William A. Shurcliff's Advice on Corporate vs. Independent Inventions"
1976 article: "Active-type solar heating systems for houses: a technology in ferment"
1973 Böer paper: "...The Delaware Experiment"
1979 Mother Earth News article: "Unit One: A Solar Adobe Home"
1980 Balcomb paper: "Performance evaluation of the Balcomb solar house"
1978 paper: "Passive Testing at Los Alamos"
1976 video: "Solar House Design"
1975 thesis: "The design and predicted performance of Arlington House"
1977 article: "UW Engineers Design Solar Energy Research House"
1977 article: "Unique Design Components to Improve Efficiency of Solar Heating System"
1976 Mother Earth News article: "Urban Homesteading: The Integral Urban House"
1980 Mother Earth News article: "The Integral Urban House"
1978 NASA report: "Instrumentation at the Decade 80 solar house in Tucson, Arizona"
1980 NASA report: "Solar energy system performance evaluation: Seasonal report for Decade 80 House"
1981 Harry C. Fischer paper: "Energy Storage and Time-of-Day Rates"
1981 Brookhaven Nat'l Lab paper: "Thermal Performance of the Brookhaven Natural Thermal Storage House"
1984 Popular Mechanics article: "Best New Homes under the Sun"
1974 Popular Science article: "Can sunshine heat (and cool) your house?" 1975 Bruce Anderson article: "The Sun in a Drawer"
1975 J.K. Page article: "Solar Housing"
1979 Michael Holtz paper: "A Classification Scheme for the Common Passive and Hybrid Heating and Cooling Systems"
1979 Oregon State thesis: "Passive solar heating residences"
1981 Buck Rogers article: "Taking the Mystery out of Passive Solar Design"
1981 Paul Goldberger New York Times article: "Assessing Solar House Architecture"
1983 Lawrence Berkeley paper: "The Impact of Building Orientation on Residential Heating and Cooling"
1981 Phillip Tabb paper: "Solar Architecture in Colorado"
2000 Mother Jones article: "Prodigal Sun"
2001 Adam Rome book chapter: "From the Solar House to the All-Electric House"
2013 Sara Denise Shreve dissertation: "Futures so bright: solar homes in mid-twentienth century America"
2013 John Perlin article: "Seven of the Greatest Solar Stories Over the Millennia"
2013 John Perlin article: "Let It Shine: The 6,000-Year Story of Solar Energy"
2013 John Perlin article: "How Ronald Reagan Turned Out the Lights on Solar Power"
2013 John Perlin lecture: "Let it Shine"
1928 Cabot pamphlet: "Build warm houses with Cabot's quilt"
1930 Johns-Manville pamphlet: "The Invisible Home"
1931 National Committee on Wood Utilization report: "House insulation: its economies and application"
1936 Johns-Manville pamphlet: "101 Practical Suggestions for Home Improvements"
1936 Insulite pamphlet: "Facts about roof insulation"
1948 USDA report: "Your farmhouse: insulation and weatherproofing"
1949 Celotex pamphlet: "How you can build better homes at lower cost"
1965 USDA report: "Thermal insulation for building construction"
1981 Popular Science article: "From the Far North: Lessons on How to Slash Fuel Bills"
2011 Monte Paulson article: "Step Inside the Real Home of the Future"
2013 Harold Orr article: "The Saskatchewan Conservation House in Retrospect"
1981 Popular Science article: "Super-insulated Houses"
1982 Mother Earth News article: "Super-Insulated House Plans"
1986 Chicago Tribune article: "Superinsulation Just Waiting To Be Discovered"
2009 Martin Holladay blog: "Forgotten Pioneers of Energy Efficiency"
2010 Martin Holladay blog: "Solar Versus Superinsulation: A 30-Year-Old Debate"
2016 Martin Holladay blog: "A Superinsulated House from 1984"